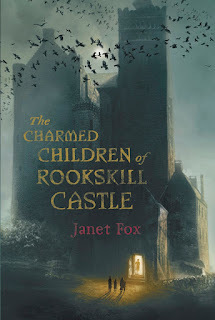 The Charmed Children of Rookskill Castle, by Janet Fox, is honestly not a title I would have necessarily sought out for its own sake, except that it's part of a middle grade fiction project that I'm working on. This title was released in March of this year and has been reviewed fairly positively, both by fine folk at Goodreads and also reviewers on Amazon. I'm not normally one for ghost stories (and this most definitely is one) but I was in the mood for a mystery so I snatched this from the top of my middle grade fiction book stack and plunged right in. Katherine Bateson is the twelve-year-old protagonist in this story which begins during the Blitz in 1940's London. Katherine and her younger siblings are being sent from the city to a castle/(manor?) in the Scottish moors which is purported to be a boarding school. The school is run by a Lady Eleanor who has no children of her own and who expressed to Kaherine's father her desire to care for the children during the duration of the war. The moment the Bateson children arrive in Scotland, Katherine realizes that something is not quite right with Lady Eleanor or the castle. She and the other children are aware of various oddities, including ghost sightings. This is a creepy tale about witches, monsters, Nazi spies, encrypted codes and soul-less children. As I say, I'm not really one for ghost stories and wouldn't normally seek them out. I made sure I only read this book during daylight hours and I did fine with it. That said, I wouldn't dream of handing it over to my own kids. It's not too terribly disturbing for an adult, but I like to sleep at nights and would prefer not to give my children any nightmares which would potentially keep us all up. I also have to confess how hard it was to limit my reading of this title to daylight hours (most of my free reading time is at night when the kids are in bed) because I was curious enough about the story to want to find out how the story would end! There is something to be said for its spell-binding quality. Once you are engaged with the story, you rather wish to revel in it a bit and enjoy the ride (as able). Ultimately my review isn't going to be sparking and positive. I am happy to say that clearly unique story lines still exist in this world and that Janet Fox was in possession of one. It's always nice to run across unique stories which have the potential to really stand out in a crowd. So many, many books are published these days that it feels dizzying and it's hard to know which ones are worth your quality reading time. 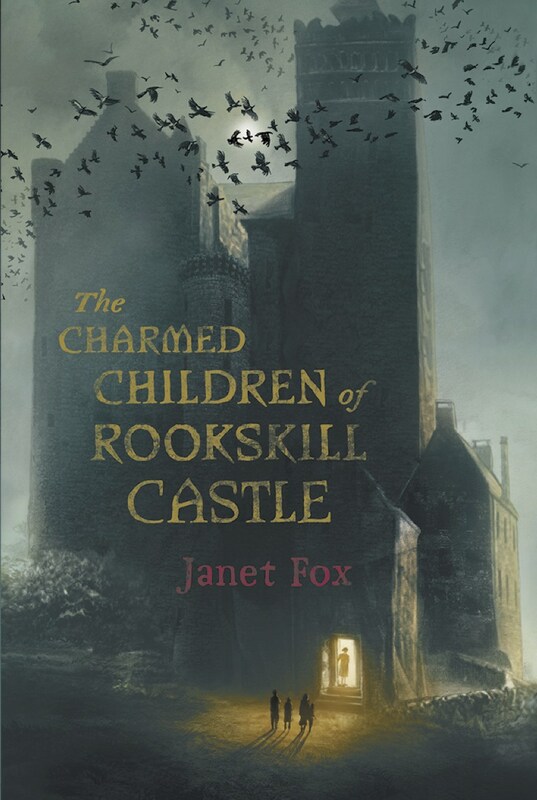 I'd love to be able to say that The Charmed Children of Rookskill Castle is worthy of your time but if I'm being terribly honest I have to recommend to you that it isn't. Which begs the question of how on earth I can simultaneously say that it's a spell binding tale and not worth your time in the same paragraph. I'll do my best to explain. As far as a story line goes, it's imaginative, clever, and unique. This book had fantastic potential to be everything you'd want in a book in terms of intriguing and mystifying characters and a good spot of adventure. Sadly, it's not very well researched or written and as a result the reader is left holding the bag, so to speak, having to make decisions to ignore glaring historical errors and the author's "voice" changing between chapters in order to enjoy the read. I found it possible to put my own mind to work to explain away errors and chose to enjoy the idea of the story for story sake. Clearly I'm not the only one who managed to enjoy this title but I do have reservations that might not be as widely held which I'll explain in a moment. It is hard to write a book. The amount of research which has to go into such a project is mind numbing to think about and I feel bad that Fox is catching flack on that point of incomplete research but should that be cause to ignore the issue?. She thanks her editors profusely in the acknowledgements but I don't know that they did her much good. Too many things were missed to make this a classic piece of literature (which, frankly, is something I hope to find with each new book I pick up). But aside from the various historical inaccuracies, and far more importantly, conservative readers will want to know that there is a strong focus on the subject of magic and the occult. Fox focuses more heavily on black magic and only references (or names?) the occult near the end. There are ghostly walks through walls, ghost children singing, blank eyes and magicked items. Near the end we read of some incantations which were more disturbing than ye olde general talk of magic. Overall, this is a title that is pretty steep in dark magic without much white for counterbalance. The lack of clear right/white magic is the chief reason I'd urge caution in reading this work. I don't mind talk of black magic when it is clearly painted out as being evil and wrong. While Fox does make it evil, there is also some confusion afoot in what is right or wrong when Katherine herself is "infected" with a bit of the black magic. Without some clear direction and distinction between good and evil I am forced to sit back and take stock of the story as a whole and my concluding opinion is that right didn't win and therefore this is a bit of a "broken" story. I'd like to say that The Charmed Children of Rookskill Castle is an interesting new look at the battle of good vs. evil which we face in this world (whether we call it "magic" or something else entirely). However, without clear victory on the side of the right, I am hesitant to recommend it. That being explained, the book ends on a cliff hanger, causing the reader to believe that there is a second book in the works. Perhaps good wins. Perhaps white magic rises up and begins to conquer. I do not know and I cannot confirm a second title but I can say that I am quite unlikely to read it. I intended to read this book as a stand alone, not realizing it might be only the first book in a new series. I just wasn't made comfortable enough with the use of magic to feel compelled to pick up the next in the series, should there be one. As a concluding note, I am well aware that it's not fun reading a negative review on a beloved book but we each have our own reading experiences and Reading to Know is my book diary documenting my own personal experiences and preferences. For my part, I can't recommend this title but you are certainly welcome to go seek out a second opinion. Thank you for your review! I appreciate your honesty. I tried to read this one, but, didn't get far into it. Sometimes I feel guilty for not finishing a book, but, there just isn't enough time to read *every* new book. Even every new book set during World War II, one of my favorite time periods to read about.